Our family has lived on the North Shore for over 15 years, so I think it’s safe for me to say that I’ve crossed the Lions Gate Bridge hundreds of (maybe even close to a thousand) times. I’m ashamed to say only a handful by foot, and never on a bike. To be honest, the thought never crossed our minds to make a point of it. If you’re thinking we took the Lions Gate Bridge, complete with its stunning panoramic views of the North Shore mountains and Burrard Inlet for granted, not to mention majestic Stanley Park brimming with fun family activities merely a stone’s throw away on the other side – you’re absolutely right. What made me wake up to the Lions Gate Bridge: two events. The first was my visit to New York last summer. I remember reading about the Brooklyn Bridge and how it was a must-see for every tourist. Walking across it was even rated as one of the top ten activities to do while visiting New York. The day I dragged my family along to walk across the Brooklyn Bridge turned out to be the wrong day: it was sweltering hot. Aside from the heat none of us could figure out what the big deal was. We crossed the East River, but the views were not amazing. All of us agreed the Lions Gate Bridge was more of a show-stopper, but just wasn’t played up as much as the Brooklyn Bridge. Second, over the years I’ve noticed more and more people walking and riding their bikes across the Lions Gate Bridge. I’ve also seen more tourists crossing the bridge. It seems people are catching on to how pretty the Lions Gate Bridge is and the amazing views it gives you when you cross. If you want to take pictures, crossing by foot or bike are the best ways to do it. If you decide to make this venture with your kids, I would suggest avoiding rush hour. A number of people ride their bikes to work and the sidewalk is not huge. Unfortunately, one cyclist fell off the sidewalk to avoid a pedestrian, and was struck by a motor vehicle. Also I suggest parking your car in West Vancouver / North Vancouver side and walking toward Stanley Park. You can tantalize your kids with the prospect of a playground, outdoor swimming pool, aquarium, and seawall on the other side. If you’re really energetic, you can even meander into town. It’s about another mile from Stanley Park. Finally, this may be a little harder to do, but the bridge has lights and is spectacular to see at night. All ages, but keep an eye on your kids. It's always give me a rush when I go over the Lions Gate Bridge on a sunny day. From the bridge you get this cool 360 degree view: the North Shore Mountains, the West Vancouver waterfront, Stanley Park, maybe a Cruise ship passing underneath, and Mount Baker on the eastern horizon. During rush hour the mix of bikes and pedestrians on the bridge sidewalks can be a bit unnerving. Be aware. The Lions Gate Bridge is located at the north side of Stanley Park and connects Vancouver with West / North Vancouver. The west side of bridge has views of Burrard Inlet, West Vancouver, and Bowen Island. The east side of bridge has views of the city, North Vancouver, and Mount Baker. I'm mentioning this because once you are on one side of bridge it's impossible to cross to other side of bridge because of the car traffic. 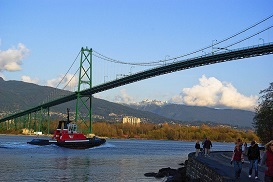 Did you know that the Lions Gate Bridge was financed by the Guinness Family (Guinness Beer), and opened in 1938? Besides the great view, the bridge provides an opportunity to show your kids how a suspension bridge works.